Hemorrhoids are a common condition that affects millions of people worldwide. People of any age can be afflicted with hemorrhoids but people over the age of 40 have a much higher chance of getting hemorrhoids because the older you get, the more the muscles in all areas of the body tend to weaken. Anyone suffering with this condition inevitably wants to know how to get rid of hemorrhoids, therefore lets discuss several popular remedies for hemorrhoid relief. It is believed that the major cause of hemorrhoids is constipation and straining. Constipation can be prevented by ingesting 20 to 30 grams of fiber daily. This is the amount of fiber necessary to keep your body regular. Since the average American consumes around 15 grams of fiber daily, it is no wonder why hemorrhoids are such a huge problem. The best way to add additional fiber to your diet is by eating plenty of fresh fruits and vegetables. You can also take fiber supplements such as Metamucil. In addition to the fiber, drink at least 8 glasses of liquid daily. This will eliminate wastes from your system and help keep your body regular, eliminating constipation and the need to strain. Following a high fiber diet and exercising regularly should drastically cut back on the number of hemorrhoid flare-ups you experience and in some cases get rid of hemorrhoids completely. Ice – Applying ice directly on the hemorrhoid has been proven to provide instantaneous relief. The ice begins to soothe the area instantly and also helps reduce the swelling. You should apply the ice in 15 minute increments as often as necessary throughout the day; or as often as you can if 15 minute increments are not feasible. Witch Hazel – When applied, witch hazel begins working immediately and will temporarily put a stop to the itching and irritation you may be experiencing. You can apply witch hazel as often as necessary throughout the day. Warm Sitz Baths – If your hemorrhoids are in full force, be sure to include 2 – 3 warm baths in your hemorrhoid treatment plan. The warm water will feel great on your hemorrhoid, it will help reduce the swelling and help keep the area clean which is extremely important to prevent further swelling and irritation. Over The Counter Creams and Ointments – Hemorrhoid creams such as preparation h are good at providing temporary relief from itching and irritation and they will also help to reduce the swelling. However, they will not get rid of hemorrhoids and are not meant to be used as a long term solution. You can use one or a combination of all of these methods to get some relief from your hemorrhoid pain. They should keep you comfortable until your hemorrhoids shrink up and disappear completely, which normally takes a week or two. 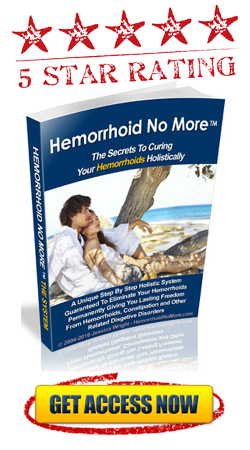 Looking for the fastest way to get rid of hemorrhoids? If you have the symptoms of hemorrhoids you will need a fast-acting treatment to get rid of them and relieve your pain.It is important to treat hemorrhoids quickly to avoid the problem becoming worse.If you would like to reduce your hemorrhoid symptoms and get back to a worry-free, comfortable life we recommend trying our number 1 rated hemorrhoids cure Hemorrhoid Rescue. If you find that you are still experiencing enough pain to be uncomfortable after using these methods combined, try taking some Aleve. Aleve is an over the counter pain reliever that has anti-inflammatory properties. It will keep you comfortable by providing relief from the pain and assist in reducing your swelling. Surgery should always be used as a last resort. However, if your hemorrhoids have become so large and painful that nothing you try is easing the pain or swelling, it is time for you to see your physician and inquire about other hemorrhoid treatments to include surgery. There are a number of different surgical procedures available depending on the severity of your condition. Hemorrhoidectomy is the complete removal of the hemorrhoid and is one of the most common and effective methods for removing hemorrhoids.